I am often asked, “I want to start juicing but, what do I need to get started?” Here are some tips that have helped me to make juicing a part of my daily routine. Recommended tools for juicing (from l to r, top to bottom.) Apple Corer • Scraper • Peeler • Small knife • 8″ Chef’s knife. • Cutting board. 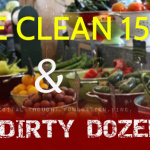 If you are going to get serious about juicing, you will need to get the right tools. 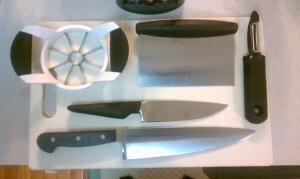 The tools we recommend are an apple corer, a scraper, a peeler, a small knife, an 8″ chef’s knife, and a cutting board. An example of these tools are shown in the picture on the right. The apple corer shown here is one of my favorite tools. It simultaneously removes the core of apples or pears while cutting the fruit into pieces that should fit into almost any juicer chute. Be sure to purchase sharp, plain edge knives and keep them sharpened. A dull knife is unsafe when dealing with produce. The knife movement used to prepare produce for juicing is a pushing or pressing motion. Serrated (jagged edged) knives are best used in a sawing motion, the motion used to cut bread and meat. For this reason, OTGH does not recommend the use of serrated knives for prepping produce for juicing. OTGH recommends sharp, plain edge knives for preparing produce. We have found inexpensive good quality knives at IKEA. Using the right tools can prevent frustration and unnecessary blood-letting. 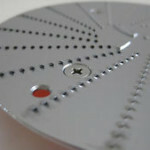 You will need a juice extractor in order to prepare the recipes in the Juice section of our site. Juice extractors, a.k.a. ‘juicers’, separate the flesh of the fruit or vegetable from its juice. Juice extractors should not to be confused with blenders and ‘food emulsifiers’ that make fruit and vegetable purees or smoothies. The ideal juicer separates the produce into a rich smooth juice and a dry (stiff of fluffy) pulp. 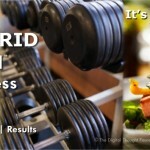 Blender commercials like to blur the lines between juicers and blenders in order to sell their machines. Blenders and juicers serve different purposes and should not be confused. I recommend starting off with a reasonably priced juicer around $100. Lower price juicers tend to have smaller chutes and can be real a pain to use due to all extra food prep required to cut produce to fit into a small chute. Centrifugal juicers, like the Breville Juice Fountain or the Jack Lalanne Power Juicer, can cause the nutrients to dissipate more quickly than other juicing methods. It is believed that the high-speed blades in centrifugal juicers can slightly heat and aerate the produce during the juicing process and consequently expedite the oxidation of the juice. Depending on the source, most of the nutrients in the juice produced by centrifugal juicers are lost in a matter of minutes or hours after preparation. For this reason some juicer manufacturers offer variable speed juicers like the Breville Juice Fountain (shown on the right). Centrifugal juicers have the advantage of being fast. However, juicers that press or slowly masticate the produce (with gears or an auger) do not aerate the juice as much and are believed to allow the nutrients in the juice to persist for up to 2-3 days. While on my fast, I could barely tell the difference between the juice I drank in the morning fresh out of the juicer and one I juiced in the morning when kept cold in my cooler until later in the afternoon. In general, I recommend consuming all fresh juices within 24-36 hours of preparation for maximum benefit. I also own a single auger masticating juicer known as ‘The Champion.’ The Champion is a classic, heavy-duty juicer with a cult-like following. I purchased it over a decade ago but I did not use this juicer during my fast because it has a very small chute and was slower than the Jack Lalanne. I have coached others who have used the Omega VRT-350 juicer on a long fast. The Omega VRT is a vertical single auger juicer. Those who used the machine liked its craftsmanship and the quality of the juice it produced. The Omega VRT-350 is highly efficient in that it produces a very dry pulp however, like other masticating juicers, it is slow and additional prep is required in order to fit produce into the chute. Tip 3. Get a good recipe book. It can be very discouraging to buy a great juicer and get all the gear, only to make terrible tasting juice. While the persistent may not give up that easily, finding the right combinations can waste a lot of time and money. 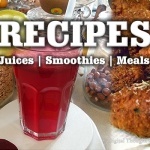 A good juice recipe book is a great way to minimize waste and to have a good initial experience with juicing. 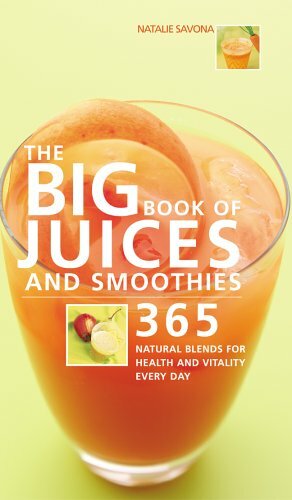 For the beginner, we recommend The Big Book of Juices and Smoothies by Natalie Savona shown on the right. It is a beautifully illustrated book, sure to get your taste buds flowing and excited about trying the next recipe. Recipes are sorted by the dominant fruit or vegetable in the recipe. The intended effect of each recipe on the body is also outlined. Tip 4. Increase your knowledge of fruits and vegetables. Tip 5. Know what to juice. This was very helpful. I just purchased my juicer and was wondering exactly what to juice. Now I can pick up the recipe book and find recipes with veggies and fruits I love that will initially help me detox and ultimately move towards my weight loss goals. So glad this helped. Juicing is one of the most effective ways to deliver nutrients to the body. For this reason, the juice we drink on a fast is important.